Famous people born on NOVEMBER 7 are not the one to parade their life in front of the camera. This Scorpio likes to stay behind the scenes and tend to business. They are quite the bashful individuals. Having the space and time to think, they want to fulfill their destiny. They know that they are unique and it doesn’t seem to bother them or their friends. In fact, they all embrace this idea. They just can’t seem to conform to what other people think they should be. This is okay as many famous activists born on November 7 were nonconformists. Where people need their help is where famous November 7 celebrities are likely to be found. This goes for their profession as well. It’s a good idea for them to be a counselor of some sort. They seem to listen to people and make them feel better after having done so. Additionally, they are great at organizing things, people and events. This is another avenue to explore as an occupation or hobby. 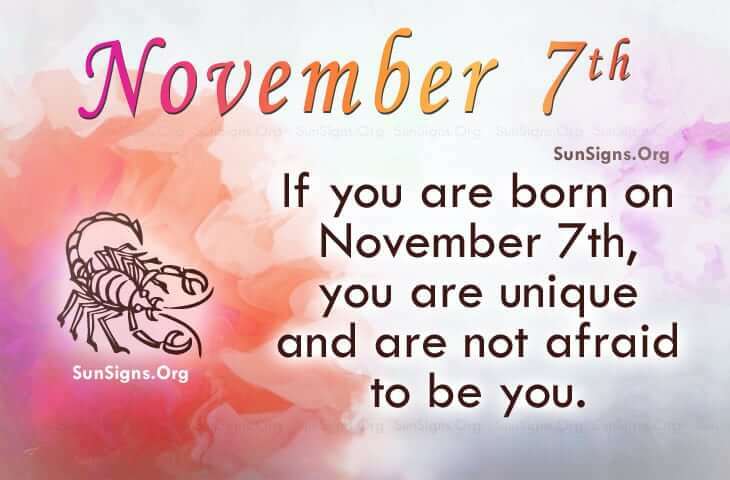 Famous people born on NOVEMBER 7th can be secretive Scorpios. They are unique and are not afraid to be themselves. Creative and misunderstood… that is what their friends say about them. From time to time, they may find themselves trying to balance their mood swings.